Mil-Ram Technology, Inc. specializes in fixed, continuous industrial monitoring of numerous hazardous gases and vapors. Mil-Ram was founded in 1990 and soon emerged as a leading innovator in fixed gas detection, utilizing several different sensor technologies to provide the best possible solution in a specific application. Mil-Ram has long specialized in the 'hard-to-detect' gases reflecting our ongoing commitment to sensor development and meeting the varied and demanding needs of industry. We offer patented electrochemical sensor technology, field proven over the years to eliminate costly false alarms. Our technical teams provide extensive applications and installation experience covering a wide range of industrial environments. The application and implementation of fixed gas detection systems relies on such experience to recommend and support effective monitoring systems where safety and reliability are critical goals. Mil-Ram's wide variety of gas detection instruments are designed to monitor and detect hazardous gases; Toxic, Combustibles, VOCs, Hydrocarbons and Oxygen for safety, environmental protection and process controls. Our instruments detect hundreds of different gases and vapors. Mil-Ram is a strong engineering based company focused on providing practical, cost effective gas and fire detection solutions to industry. 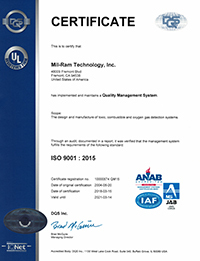 Mil-Ram Technology, Inc. is pleased to acknowledge that our quality systems have been registered by Underwriters Laboratories, Inc. (UL-DQS) to the requirements of the International Organization for Standardization ISO 9001:2015. The term "quality system" refers to the organizational structure, responsibilities, procedures, processes and resources for implementing a quality management system. Mil-Ram Technology is dedicated to our customers and is always committed to maintain and promote quality in our processes, our products and our performance as a leader in the gas detection industry.